Common Tree and Shrub Diseases | Fairway Green Inc. Most of us look forward to Spring, especially after the long, cold winters we receive in New Jersey. Gone away are the drab and cold. Here to stay are rejuvenation, flowers, and warmth. Buds turn into leaves, flowers pop out of the ground, replacing the gray of winter with a splash of color. Lawns begin to green up and people are spending more time outdoors. Unfortunately, while all this is happening, disease pathogens are attaching to certain plants. This usually happens during cooler, rainy weather, which is another staple of Spring. Common plant diseases are usually separated into two categories: cosmetic and non-cosmetic. Cosmetic plant diseases generally do not cause permanent damage to plants. However, if the plant were to get the same cosmetic plant disease year after year causing premature leaf drop, the plant can weaken to the point where it cannot fight off other pests. While, non-cosmetic diseases can kill the plants if left untreated. Most plant disease symptoms do not show up until early summer, or even early fall; however, during the cool, wet weather in the spring disease spores are formed and attach to host plants. These spores need certain weather conditions to progress into a full-blown disease epidemic. 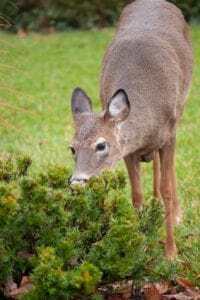 The most common tree and shrub diseases we see in the landscape are apple scab and rust on crabapples, anthracnose on dogwoods, Volutella on pachysandra, and rust on pear trees. Bellow we will go further into each common tree and shrub disease. Let’s start with the crabapple trees and the common tree diseases. These trees produce beautiful, vibrant flowers in the spring, but can become an eyesore and create a mess of leaves in the summer. When this happens, apple scab and rust are usually the culprit. In the beginning of the plant disease cycle, leaves will have orange spots on the upper part of the leaf, and a spiky appearance below those spots on the bottom of the leaf. The leaves then begin to turn yellow and the result is premature defoliation. Oftentimes, people think the tree is dying. The good news is that these two plant diseases are foliar and will not kill the tree; however, as stated earlier, if the tree gets these diseases year after year, it can weaken the tree to a point where it cannot fight off other pests. The other good news is that the symptoms of these two common tree diseases can be significantly reduced with a sound disease control program. Treatment will need to commence at bud break and another treatment should be applied two to three weeks after initial treatment. 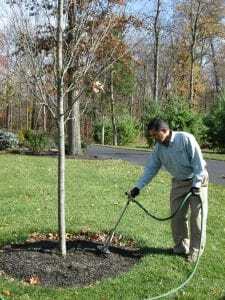 The objective of the treatment is to inoculate the leaves to stave off disease spores that create apple scab and rust. Pear rust is very similar to crabapple rust and treatment is the same. The second most common tree and shrub disease we run into is anthracnose on Dogwoods, although anthracnose can also be found on a wide array of plants. Symptoms include tan spots on the leaves that can morph into black, crumpled appearances. In severe cases, the shrub disease can reach the twig portion of the tree and cause twig dieback. This results in epicormic growth, or ‘sucker growth’, where the growth shoots form on twigs. With sound cultural practices, the symptoms of this disease can be kept to a minimum. Dogwoods prefer a partly shaded location, so try to avoid planting them in the full sun because sunny locations can stress dogwoods, potentially causing other pests to invade the tree. Be sure to water them during hot and dry periods. Foliar plant disease sprays can be applied in the early spring to help provide another layer of protection. Treatments should begin at bud break and another treatment should be applied two to three weeks after the initial treatment. Mow down the patch. Yes, you read that correctly, mow it down. Once mowed, be sure to remove all the clippings and place them in a sealed, plastic garbage bag. 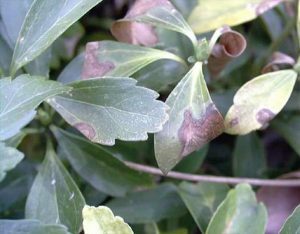 The lesions are on the leaves of the plants, and these lesions are what causes the disease to spread. Fertilize with a granular fertilizer to stimulate growth. Water the patch to activate the fertilizer. Once the new patch grows, pursue a sound disease control program. This should consist of three foliar fungicide applications yearly to help keep the Volutella disease at bay. If you are interested in learning about common lawn diseases that are separate from plant diseases that affect your trees and shrubs, check out our blog posts. When dealing with common tree and shrub diseases, it is important to understand if the disease is cosmetic or non-cosmetic and if it requires treatment to save the life of the plant. Fairway Green, Inc., can help you identify and control these diseases. If you are in our service area and have any questions or if you would like an estimate for a foliar fungicide program, please do not hesitate to contact our office at 908-281-7888.